Fundraisers in New York, San Francisco and Atlanta for India-based NGO Akshaya Patra, that strives for wholesome school kitchens, are expected to raise a whopping Rs 5 crore this year. Arthur J Pais reports from New York. Today, N R Narayana Murthy is a household name, but more than four decades ago he was just another commoner returning back to his roots in India after having worked in France for months. In a border town in Bulgaria, a powerful Communist state then, Murthy was asked to evacuate the train compartment by the police and was put in solitary confinement for 125 hours -- without food or water. His crime? He was speaking with a passenger -- a young woman -- in French. The police suspected him of being a spy. This incident was a turning point of sorts in Murthy's life. 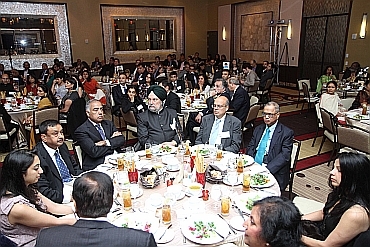 "The experience was the first step that turned me from a confused socialist to a determined compassionate capitalist," said the founder of Infosys, while addressing over 200 people at the annual fundraiser of Akshaya Patra in New York. Murthy, a board member of Akshaya Patra, a non-government organisation that offers wholesome and free meals to over 13 lakh students in 8,000 schools across eight Indian states, cited the Bulgarian example for two reasons. He says he experienced what it was to go hungry and secondly the meal scheme, which costs Rs 1,850 a year to feed a child, is not only a great example of a private-government partnership but also that of compassionate capitalism. It was in the Bulgarian jail that he felt the anger that a starved person feels towards the society. Over the years, he keeps returning to that experience in Bulgaria only to sharpen his conscience as a compassionate capitalist who strongly believes in social entrepreneurships such as Akshaya Patra. Only a gentle but persistent social entrepreneurship such as Akshaya Patra can bring out a huge change across India and make the country "safe" unlike other nations witnessing catastrophic upheavals, he said. 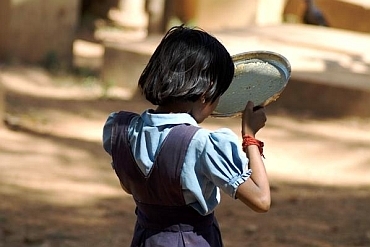 Madhu Sridhar, president and chief executive officer of Akshaya Patra, USA, which was set up five years ago, said that of the Rs 1,850 that it takes to feed a child through the school year, Rs 1,100 comes from government subsidies and the remaining Rs 750 is the contribution made by their NGO. 80 per cent of these funds come from India. The New York fundraiser is among half a dozen events held this year in cities including Boston, San Francisco and Atlanta that is expected to raise $1 million (about Rs 5 crore) for charities. 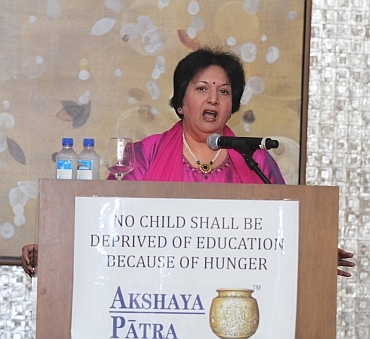 "While Akshaya Patra is the largest NGO of its kind in the world, it could grow manifold. One of the reasons behind its success is the large scale and low-cost operations driven by the passion of volunteers and full-time workers," said Madhu. Murthy said bureaucrats from Karnataka to Rajasthan had gone out of their way in removing bottlenecks to help in the creation of kitchens that cater to schools. He pointed out that over 350 million people in India live below the poverty line, 250 million do not have access to clean drinking water and over 26 million children are not able to go to schools because they have to work to help their families get minimum sustenance. "The great experiment by Akshaya Patra has proved that hot and free meals increased school attendance and also showed that children with filled stomachs studied better. The experiment was an example of inclusivity of growth that Prime Minister Manmohan Singh continually talks about," Murthy said. "Compassionate capitalism is the only way to take the country forward," he asserted, adding that he was proud to be involved with Akshaya Patra for two important reasons. One, he appreciated how many IITians including Madhu Das, who is now a monk, are involved in creating technology to make the food creation and distribution at low costs. Two, he is "thrilled" that Akshaya Patra is "an absolutely secular organisation". "I am indeed proud it has brought solace" to millions, whether they are Christians, Muslims, Jains or Hindus. The religion of the child does not matter at all," he said. At an economic summit in Davos, Murthy said a head of a huge business company asked him how he would define success. "Success to me is bringing a smile to people when I enter a room," Murthy said. "It is a way of communicating to the people in a room why by my actions." 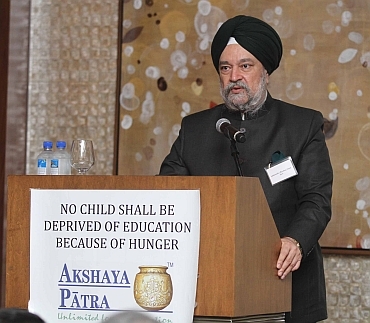 Referring to Akshaya Patra's goal to feed five million children by 2015, he said it was doable especially with the help of NRIs across the world. Over the years during his travels to more than 120 countries and meeting expatriate Indians, Murthy said that he did not find a single person who did not want to help bring smiles to the marginalised people. "Life is worth living for all of us thanks to your extraordinary contribution to this cause. What Akshaya Patra and other NGOs were doing in India was nothing but short of a revolution," he said. Hardeep Singh Puri, Indian ambassador to the United Nations who was present at the event said that he did not like to attend fundraisers because often there was emphasis on merry making and more money was spent on organising the event than contributing to the charity. In the case of Akshaya Patra, it was a very different story, he said. 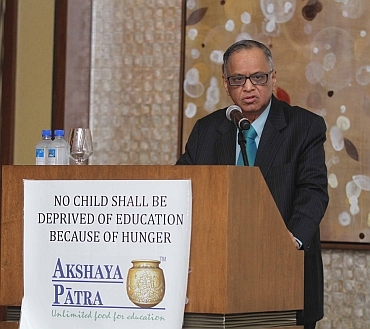 Over the years, Murthy has served as a guest speaker at many Akshaya Patra events. The US board of Akshaya Patra includes the holistic guru Deepak Chopra and editor and writer Fareed Zakaria.